Even frugal parents can attest to the fact that kids’ toys seem to multiply when no one is watching, slowly growing and taking over several rooms of the house, cluttering every available space, and presenting a tripping hazard for grownups. A bit of observation will usually reveal that the vast majority of these toys are rarely, if ever, touched by the kids that own them. With this in mind, here are ten tricks to keep your kids from storing up toys like miniature hoarders. One In, One Out – Treat your kids’ bedrooms or playroom like a swanky nightclub; one goes out, another can come in. This forces your kids to choose only the toys that they like best, getting rid of others in order to make room for the new ones, which might help to minimize materialistic ideals later in life. Organize Garage Sales – If your family is in the practice of arranging garage or rummage sales, it might be a good idea to allow kids their own tables filled with the toys they no longer play with and a cash box of their own. Learning to make correct change, manage money and reduce clutter are all valuable lessons they can learn from this experience. Donate to Charity – It’s never too early to teach your children the power and value of giving to those that are less fortunate. Explaining the concept of charity toy drives and collections while helping your child choose toys to donate can help them learn compassion while reducing the number of neglected playthings in their rooms. Cull Periodically – Setting a schedule for culling toys, perhaps with each changing season, is a great way of purging broken, outgrown and simply uninteresting toys that are crowding available space. Getting kids in the habit of preparing for the quarterly purge is a great way to instill the value of organization and routine, as well. 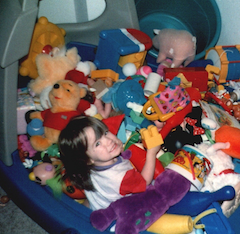 Get Rid of Outgrown Toys – Throwing away a favorite toddler toy might be heartbreaking for parents, but a third-grader probably has little use for the play mats and mobiles he favored as an infant. Storing items with particular sentimental value out of the way is a good way to free up space in your child’s room, but it’s important to be judicious about the pieces you keep, rather than simply storing them all. Rotate – Placing all of your children’s toys in plastic bins with lids and periodically rotating those bins between their bedrooms and storage is a great way to keep old toys feeling new, and also give you an idea of what can be safely donated or thrown away. Toys that are consistently ignored can be disposed of, making room for the favorites and future gifts. “Share” With Family – Kids that have a hard time parting with their toys, even those they don’t play with, might warm up to the idea of donation if their old playthings are being “shared” with friends and family members that have children who are slightly younger than they are. Explaining to your child that they’re too old for certain toys, but that the younger child is just the right age and needs them now might ease the sting and help kids understand the concept of sharing. Toss the Filler – The small, cheap toys that come in fast food kids’ meals and in birthday party favor bags can really contribute to the chaos in your child’s toy box, and are very rarely even noticed by your child. Tossing these trinkets immediately unless your child expresses a particular interest is a good idea; otherwise, you’ll be faced with a mountain of them before you know it. Store Special Occasion Toys – There are some toys, such as the classic game Mouse Trap, or an Easy Bake Oven, that just aren’t suitable for everyday use. Toys with dozens of small pieces, the ones that make a mess, or those that require close supervision should all be stored away, making room for safer toys that can be played with regularly while keeping the special ones stowed for a rainy-day surprise. Have an Organizing Day – If the clutter in your kids’ rooms has reached critical mass, having an “organization party” of sorts might be just the trick to get kids interested in helping and squelch rumblings of rebellion at the idea of parting with playthings. Instead of raiding their rooms and disposing of things while the kids are at school, let them make the decisions about what goes; just be prepared to offer guidance and encouragement when they hesitate to part with everything. While it might be considered presumptuous to request that distant friends and acquaintances refrain from gifting toys and games to your child, very close friends and immediate family will likely be receptive to the idea of giving gifts of clothing, savings bonds or other items rather than contributing to the pile of toys they’ll receive from others on large gift-giving occasions.